Mission One: Tokyo, 2020. The city is on the verge of famine, with rice rations expected to run out in weeks. Pacific fisheries are at an all-time low. Temperatures are rising; crops are dying. The population is malnourished. It's not just Tokyo, but the entire world. Will you help? You, yes you, can become part of a global network of secret agents who must complete 10 missions to solve the world's most pressing problems: poverty, hunger, water security, energy, disaster relief. Humanity needs your help. Go. As school wraps up and kids retreat to virtual worlds, parents fear their children are hunkered down in the basement, slaying aliens. What if they were solving real-world problems? Could video games be the antidote to apathy? The scenario above is Evoke, an online game developed by the World Bank Institute with designer Jane McGonigal. A comic-book narrative calls on players to become agents of social change. Using the game's "superpowers," such as collaboration, resourcefulness and local insight, they invent solutions to humanity's greatest threats, then share ideas in blog and video posts. The most innovative solutions received seed money, scholarships or mentorships to turn fledgling ideas into functioning social enterprises. McGonigal is proving that games can engage players in alternate worlds while promoting skills that translate to real life. Gamers experience "urgent optimism," which she describes as the intense desire to achieve something combined with the unwavering belief that anything is possible. In her 10 years of research at the University of California at Berkeley, she's found that all types of games have positive psychological benefits. With online games, kids are part of global networks as they learn to cope with failure and persevere when faced with a challenge. We're frequently confronted by kids - and parents - who, distraught from tragedies in the daily news, feel frustrated instead of compelled to act. What if the "can-do" attitude kids learn from video games manifested in their daily actions? The question seems odd, since we think of video games as an escape from reality. But we grew up in an age of solitary teens playing Mortal Kombat. Maybe it's time to reconsider the social impact of virtual reality. It used to be that kids had international pen pals to become aware of global issues and promote cultural understanding. Xbox Live now boasts 30 million users worldwide, and that's just one console. Now kids can chat in real time with friends on the other side of the planet. Evoke sparked a worldwide movement. Its first round saw 19,000 players collaborate to increase food security and access to clean water, and fight poverty in 130 countries. After 10 weeks they'd founded 50 real-world organizations, including Libraries Across Africa, now in its pilot phase in Gabon. McGonigal has also built World Without Oil, an online game that simulates the first 32 weeks of a global oil crisis. Fictional newscasts and data feeds list local petroleum prices, explain how food delivery is affected, whether there's rioting or school closures, and players adapt strategies to survive the shortage. McGonigal tracked the 1,700 pilot participants for three years, and most had kept up their energy-conserving habits post gaming. If we want to turn younger players onto social issues through games, there's Club Penguin's Coins for Change. Kids play as penguin avatars, decorate their igloos and earn coins to distribute, prioritizing needs and assessing social impact by donating to realworld causes. So far, Club Penguin charities, including Free The Children, have helped 200,000 kids go to school and provided medical care for two million people across the world. Still, there are misfires. Recently, the Danish Refugee Council had to suspend a game called The City That Shouldn't Exist, where players tried to help 100,000 starving refugees destined for the world's biggest camp. The prize for participants was a chance to win an all-expenses-paid trip for two to Dadaab, home to 332,000 refugees from Somalia and Ethiopia. This game was accused of being in bad taste. Accra, Ghana - Ethiopian authorities have been holding a newspaper columnist incommunicado since Tuesday, according to the media watchdog, Committee to Protect Journalists (CPJ). It quoted local sources in a statement received by PANA on Saturday that Reeyot Alemu, a regular contributor to the independent weekly Feteh, was expected to spend the next four weeks in preventive detention under what appears to be Ethiopia’s sweeping anti-terrorism law. CPJ said Alemu was the second journalist picked up and held without charge in less than a week and taken into custody at the federal investigation centre at Maekelawi Prison in the capital, Addis Ababa. Deputy Editor Woubshet Taye of the weekly Awramba Times has been held since Sunday, according to CPJ research. It said the authorities had not disclosed the reason for Alemu’s arrest, but a local lawyer who requested anonymity for fear of government reprisals told CPJ that she had been transferred into preventive detention for a period of 28 days, pending further investigations. This is the minimum period for preventive detention under Ethiopia’s 2009 anti-terrorism law, according to legal experts. Ethiopia’s code of criminal procedure allows for preventative detention for a minimum of 14 days. According to CPJ said Ethiopian government spokesman Bereket Simon said on Friday that he was not immediately available to comment. Local journalists said they believed Alemu’s arrest could be related to her columns critical of the ruling EPRDF. Alemu’s June 17 column in Feteh criticised the government's public fund-raising methods for the Abay Dam project, and made parallels between Prime Minister Meles Zenawi and Libyan leader Muammar Qaddafi, according to local journalists. Alemu was picked up at a high school in Addis Ababa where she teaches English, according to local journalists. Police then searched her house. Ethiopia has six journalists currently behind bars, behind only Eritrea as the nation detaining the largest number of journalists in Africa. Eritrea holds at least 17 members of the press in its secret prisons, according to CPJ research. Sudanese President Omar al-Bashir has threatened to shut pipelines carrying South Sudan's oil if a deal on oil is not reached before it secedes in July. He said either the south could continue to hand over half of its oil revenue to the north, or it could pay for using the north's oil infrastructure. Mr Bashir warned that if neither was accepted, he would block the pipeline. Three-quarters of Sudan's oil is in the south, but most pipelines, refineries and the main port are in the north. Southerners voted for independence in a referendum in January. President Bashir made his threat in a speech at a rally in Port Sudan - the main oil export terminal - which was broadcast on national television. "I give the south three alternatives for the oil," he said. "The north is to continue getting its share, or the north gets fees for every barrel that the south sends to Port Sudan," he added. "If they don't accept either of these, we're going to block the pipeline." The BBC's James Copnall in the capital, Khartoum, says oil accounts for about 98% of the south's income, so any reduction in the oil flow would be disastrous. The government of South Sudan has floated the idea of building a new pipeline through Kenya or Uganda, but this would take several years, our correspondent adds. 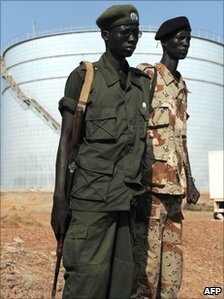 Talks are continuing between northern and southern Sudan about oil and other vital pre-independence issues, including citizenship and the disputed border region of Abyei. Last month, the northern army seized control of the disputed region of Abyei, but a deal was reached on Monday which will see it withdraw and be replaced by Ethiopian peacekeepers. A new report published by the House of Lords, the UK's upper chamber of parliament, highlights the many issues that will bedevil future Sudanese relations, including oil. Abdullahi al-Azreg, Sudan's UK ambassador, told the committee preparing the report that Norway had been advising both sides on negotiations for the split. "They have suggested a kind of financial transitioning in which Sudan - the predecessor state - will have 50% of the oil revenue, but this percentage will diminish to zero over six years," he said. South Sudan's UK envoy Daniel Peter Othol said the south would consider its options, and that building an alternative pipeline through Kenya could take three years to complete. "Some of our leaders say: 'We are not going to share the oil if the south becomes independent. We are only going to rent the pipeline,'" he said. "Given the conditions attached to the revenue of the oil, the rent of the pipeline could be even higher. We have to see which way is better for the south to benefit from the oil." The report - The EU and Sudan: on the Brink of Change - says that in the last six years the south has received around $11bn (£6.8bn) from its oil so far, but there is little to show for these revenues. It also pointed to other obstacles the south will have to overcome - endemic poverty, corruption and the proliferation of weapons. The report concludes that "the risk that the new country of South Sudan will fail as a state is high, even if the international community maintains the current levels of assistance and support". The great divide across Sudan is visible even from space, as this Nasa satellite image shows. The northern states are a blanket of desert, broken only by the fertile Nile corridor. Southern Sudan is covered by green swathes of grassland, swamps and tropical forest. How can an Ethiopian reporter cover the activities of Ethiopia's leading opposition figure,Berhanu Nega, or an attack by the Ogaden National Liberation Front (ONLF) rebels without risking prosecution and a 20-year prison sentence? Such questions have haunted Ethiopian journalists since a far-reaching anti-terrorism law came into effect in 2009. The law criminalizes any reporting authorities deem to "encourage" or "provide moral support" to groups and causes the government labels as "terrorists." 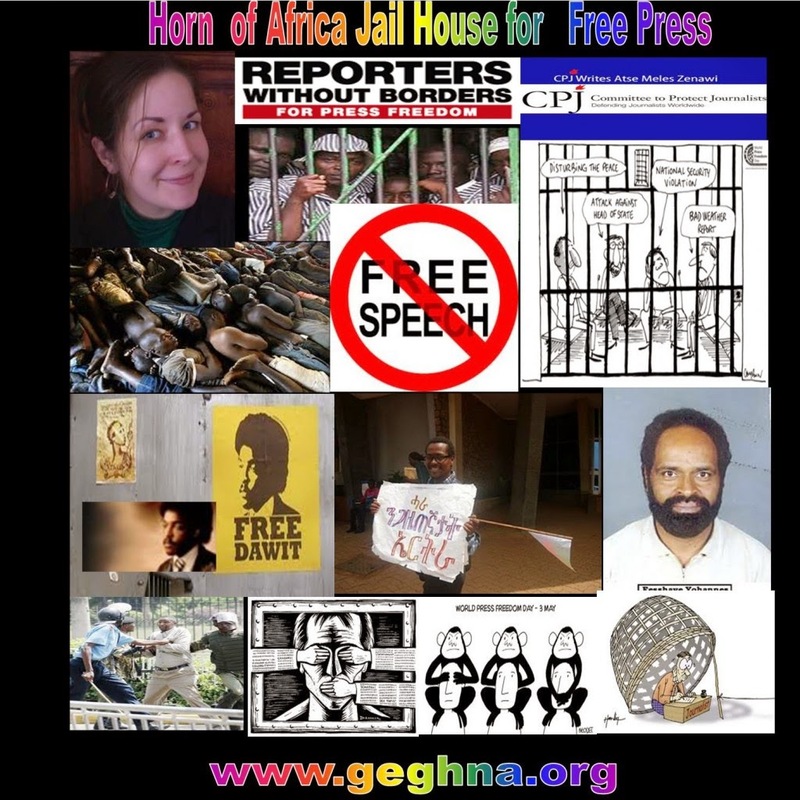 Ethiopia is a country whose relative stability in the troubled Horn of Africa region is in great part maintained by repression of dissent and ever-increasing restrictions on thefreedom of the press. It receives praise and assistance for its participation in U.S. counterterrorism in Somalia, but for Ethiopian journalists, reporting on terrorism (as defined by their government) without risking jail time has become too risky. The Ethiopian government has long considered the ONLF, OLF, and Ginbot 7 terrorist outfits and also targeted international media for providing coverage. In 2009, the Ethiopian government went as far as accusing the Kenya-based broadcaster Nation Television (NTV) of giving a platform to terrorist groups in the Horn of Africa for airing areport on the OLF. In 2008, authorities accused Qatar-based satellite network Al-Jazeera of "direct and indirect assistance to terrorist organizations" over an exclusive report on the ONLF. In 2007, three New York Times journalists were detained for five days forreporting on the ONLF. To exiled Ethiopian blogger Kiflu Hussein, the risk of retroactive persecution or prosecution on previous coverage poses another threat to journalists. "Anything ever written about these now outlawed groups could be fair game," said Hussein, who lives in Uganda. "The ruling party is known for holding grudges and applying its draconian legislation retroactively to target its adversaries, real or perceived." YouTube - Egypt's military clamp down on bloggers: " "
I had been reviewing movies professionally for less than two months on June 12, 1981, when I took on Mel Brooks' "History of the World, Part I'' ("a massive farce that is his most uproarious since "Blazing Saddles'') and the original "Clash of the Titans'' ("classic Saturday matinee fare aimed squarely at an audience of 10-year-olds''). In that same day's paper, there was also my lukewarm review of a Paramount release that I caught the week before at a Friday night sneak preview at the long-gone Loews Showboat Quad in Edgewater, N.J. (in those bygone days the previewed movie was free with admission to the movie playing regularly on the screen at the time, in this case "The Sea Wolves'' with Gregory Peck and David Niven). The movie I later came to regret dissing was "Raiders of the Lost Ark,'' and the occasion my review today of the Steven Spielberg-produced "Super 8'' today lends a special poignance to this old review. I was even tougher on the first two sequels, but finally came to my senses in time for my review of uh, "Indiana Jones and the Kingdom of the Crystal Skulls.'' What can I say -- I was smitten with Karen Allen. Anywhere, here's the original review, followed by my capsule reviews of two other titles that appeared that same day. The year is 1936 and Indiana Jones, an American archeologist in a leather jacket and a snap-brim hat, is searching the jungles of Peru for a golden idol. Of course, the cavern that houses the idol is booby-trapped with scorpions, poison darts, sliding spiked walls, and a giant boulder that nearly crushes Jones. With a lot of pluck and ingenuity, he narrowly escapes with the treasure, only to be confronted by a tribe of hostile Indian warriors working for his villianious French archrival. This spectacular sequence is only the prologue to "Raiders of the Lost Ark,'' a breathtaking attempt by Steven Spielberg and George Lucas to revive the cliffhanger genre. "Raiders'' makes for a very entertaining junk-food movie that will be forgotten long before either man's previous work. "Raiders'' is almost totally derivative, a technically proficient but empty-headed homage to movie serials of the 1930's and 1940's that has absolutely nothing of its own to say. While the film is a great deal of fun, it lacks the creative sparkle of Spielberg's earlier efforts, especially "Close Encounters of the Third Kind.'' Perhaps Spielberg's caution tems from the failure of "1941,'' a highly original black comedy about Los Angeles right after the attack on Pearl Harbor. It's probably even more unfair to compare "Raiders'' unfavorably to "Star Wars,'' but the temptation is there, since "Star Wars'' director Lucas co-produced "Raiders'' and collaborated on the story. The new movie also stars Harrison Ford, the swaggering Han Solo of "Star Wars'' as the whip-wielding, vaguely Jimmy Stewart-like hero, Indiana Jones. "Raiders'' is a much more modest undertaking, an old-fashioned adventure story that eschews science-fiction prytechnics until the very end. Kids will probably love it, but its campy humor is much less satisfying for adults than "Superman II,'' which will open next week. The premise is deliberately hokey. Army intelligence sends Jones -- or Indy, as he's known -- to find the Ark of the Covenant, a gold-encrusted chest containing the broken tablets of the Ten Commandements. It seems the Germans are on the verge of digging up the Ark, which the occult-obsessed Hitler believes will endow him with mysterious powers that will make him invincible. This is obviously a fiom that requires total suspension of disbelief. According to legend, the Ark actually contains a second, unbroken set of tablets. If you carp about tht you might begin questioning what hundreds of armed, uniformed Nazis are doing running around in Egypt, six years before they invaded that country. "Raiders'' is set in a world that's totally oblivious to history, politics or religion. Ford is pleasantly self-effacng -- if hardly memorable -- as Indy, who explains his quest thus: "I'm just making this up as I go along.'' But then the only thing resembling a flesh-and-blood character in [Lawrence Kasdan's] screenplay is Marion, a wisecracking scientist's daughter whom Indie had jilted 10 years earlier. Karen Allen, who played the coed who became involved with Donald Sutherland in "Animal House,'' is delightfully spunky as Marion. Whether she's belting Indy in the mouth at their reunion at her bar in Nepal or trying to escape from the French villain by drinking him under the table, Allen is in control, delivering the corny dialogue with total aplomb. For the most part, Spielberg handles the cast muchless well than the machinery and stunts in the marvelously executed action sequences. He pulls out all the stops in the opening, as well as in another standout scene which has Marion trapped in the cockpit of a grounded Nazi Flying Wing airplane while flames race toward a nearby gasoline truck. Meanwhile, Indy and a bare-chested German are fighting it out beneath the plane's whirring props. By this point, Indy has escaped death so many times -- and with so little effort -- that it's a little hard to take the danger very seriously. In the old time serials, the cliffhanging situations came at the end of each weekly episode; stringing them together in one movie lessens their impact. As with "1941,'' this film suffers from Spielberg's excesses as a director. While spoofs generally involve exaggeration, Spielberg goes in for overkill. Take the scene -- shades of "Gunga Din'' -- where Indy and Marion have a close encounter with thousands of writhing and hissing snakes in an underground chamber. One good cobra is a lot scarier, as anyone who's seen "Lives of a Bengal Lancer'' can attest. But then, "Raiders'' doesn't even attempt the gut-wreching terror Spielberg evoked with "Jaws.'' This film is strictly a Saturday afternoon lark, laced with an abundance of hamfisted humor. There is only one truly moment in the film, a very clever surprise that Spielberg uncorks when Indiana is confronted by a black-robed Arab with a gigantic scimitar. The rest is mostly demolition-derby wit, with Indiana killing off enough Germans to make World War II seem anti-climactic. "Raiders'' has tremendous brio, greatly enhanced by eye-popping sets, Douglas Slocombe's crisp cinematography and John Williams' pounding score. "Raiders of the Lost Ark,'' which opens today at area theaters, is rated PG. Scores of actors are blown up, shot, impaled, crushed and incinerated, but Indy barely gets to kiss Marion. YouTube - Google Doodle‎ Homepage Logo a Interactive Les Paul Guitar today: " "
Google being attacked by Chinese hacker teams? YouTube - Is Google being attacked by Chinese hacker teams? : " "